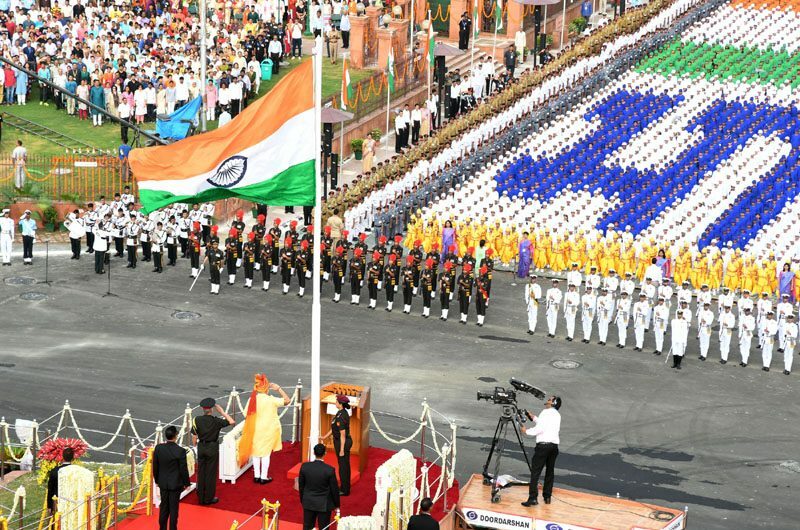 The Prime Minister, Shri Narendra Modi, today addressed the nation from the ramparts of the Red Fort on the 71st Independence Day. The Prime Minister recalled the great women and men who worked hard for India’s freedom. He said the people of India stand shoulder to shoulder with those affected due to natural disasters, and the tragedy in Gorakhpur. The Prime Minister noted that the current year is special, because it marks the 75th anniversary of the Quit India Movement; the 100th anniversary of Champaran Satyagraha; and the 125th anniversary of the celebration of ‘Saarvjanik Ganesh Utsav’ – inspired by Bal Gangadhar Tilak. The Prime Minister said that the nation had shown its collective strength between 1942 and 1947, culminating in India’s independence. He said that we must show the same collective determination and resolve to create a New India by 2022. He emphasized that everyone is equal in our nation, and together we can bring about a qualitative transformation. The Prime Minister called for an end to the “chalta hai” attitude of complacency, and its replacement with an attitude of “badal sakta hai” for positive change. Shri Narendra Modi said that India’s security is our priority, and the surgical strike had underscored this. He added that India’s stature in the world is rising, and several countries are cooperating with India in fighting the menace of terrorism. On demonetization, he said that those who have looted the nation, and the poor, are not able to sleep peacefully, and honesty is being celebrated today. He asserted that the fight against black money will continue, and technology will help bring about transparency. He encouraged people to further promote digital transactions. The Prime Minister described the implementation of GST as a key illustration of cooperative federalism. He said the poor are joining the mainstream through initiatives of financial inclusion. He emphasized that good governance is about speed and simplification of processes. On Jammu and Kashmir, the Prime Minister emphasized that neither abuses, nor bullets, but only embracing, can solve the problems in the State. (Na gaali se, na goli se, parivartan hoga gale lagaane se). Describing his vision for New India, the Prime Minister said that people would be the driving force behind the establishment, rather than the other way around – Tantra se Lok nahin, Lok se tantra chalega. The Prime Minister appreciated the farmers and the agriculture scientists for record crop production this year. He said the Government had procured 16 lakh tonnes of pulses this year, far in excess of the procurement of previous years. The Prime Minister said the changing nature of technology is resulting in the requirement of different skill-sets for employment. He also added that the youth is being nurtured to become job-creators, and not job-seekers. Mentioning women who have to suffer due to Triple Talaq, the Prime Minister said that he admires the courage of those who have stood up against this practice, and added that the nation stands with them in their struggle. The Prime Minister said significant attention is being paid to the development of eastern and north-eastern India. He said the Government has taken India on new tracks of development, without slackening pace. He called for a New India where the poor would have houses, and access to water and electricity; where farmers would be free from worry, and would earn twice of what they earn today; youth and women would get ample opportunities to fulfil their dreams; an India free from terrorism, communalism, casteism, corruption and nepotism; and an India which is clean and healthy. The Prime Minister announced the launch of a website to honour gallantry award winners.